As an example, odourless mineral spirits mixed with a recipe that includes Dammar do not work together. You must use turpentine with mixes that have Dammar. Linseed oil is also available as sun-thickened linseed as well as stand oil. 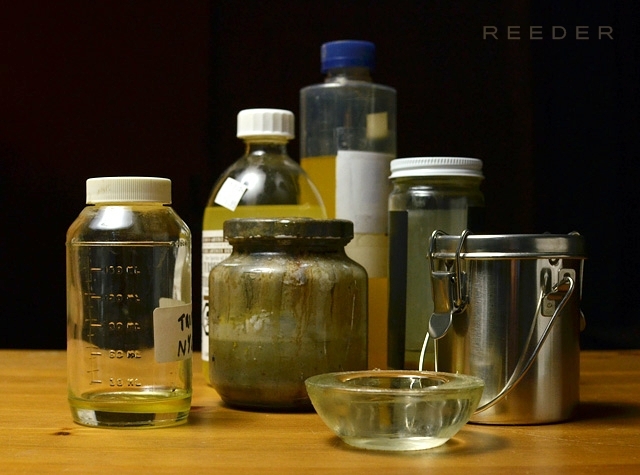 Each form of this oil results in a different quality of surface and drying time. In your research you will find many recipes to make your own mixes. Have fun experimenting to see what they all can do but be safe and keep everything labeled. Check out “Formulas for Painters” by Robert Massey, it’s a good place to start. Remember most if not all of these substances are flammable so treat them, yourself and your environment accordingly. Also protect your skin, work cleanly and try to keep good ventilation at all times as the fumes can be harmful. Never ever pour any of these solvents down the drain! When using my mix while painting, I take what I need as I need it but otherwise keep all containers closed. It does a world of good as far as the air quality in my studio space. Another piece of advice I would like to offer here is don’t get mix happy. The paint should be the primary focus here. Painting and thinning out your paint too much in an effort to add the “unique quality of said awesome oil mix” could easily do more harm than good. Keep a balance, focus on the paint, be sparing with your mix. Stay tuned for my next post for some book recommendations and advice on furthering your artistic education.